Make Your Own “Souper-Healthy” Soup Stock! On this week’s episode of our show, Mike, Lisa and I continue our discussion of the very necessary departure from dependence on factory & processed foods to homemade creations made with ingredients that are in most everyone’s kitchen. The first part of our discussion is about digestion, and how it is at the core of good health. What foods aid in digestion? 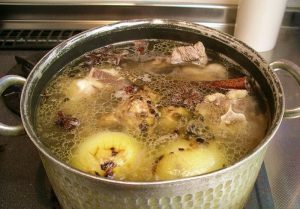 Did you know that homemade stocks are simple to prepare yet are key to a healthy diet? Homemade bone and fish stocks supply vitamins and minerals in super-abundance! “Jewish Penicillin” — i.e. homemade chicken stock — didn’t acquire its nomenclature for nothing! Eating foods prepared naturally and in our own kitchens is not only do-able, but it’s actually quite simple and can be accomplished by anyone — even the most untrained cooks! On Saturday’s show, Lisa and I give you our own recipes for easy, homemade and super-healthy stocks. Set your computer clock to automatically join us every Saturday! The show is aired on your computer at 7:30 a.m., 2:00 p.m., 4:30 and 6:00 pm. 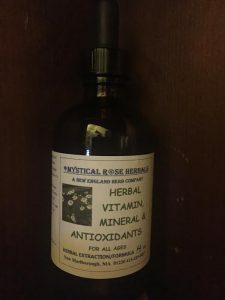 http://www.magnificatmedia.com Mystical Rose Herbals LISTEN LIVE! Is it Winter Thyme or Is it Spring Thyme??? FREE SHIPPING ON Your Springtime Liver Cleanse! Sign Up Here to Get Notice of New Posts! We'll send you an email when we publish a new post. De-tox Baths – Warm up and De-toxify at the same time! Great & Unique Last Minute Gift Idea! Berkshire Meadows Herbal Health Tea – Vitamins and Minerals in A Delicious Cup of Tea! 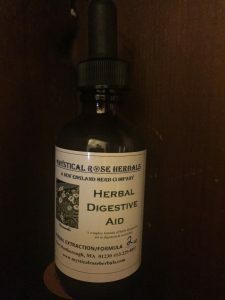 A BLOGSITE FOR MYSTICAL ROSE HERBALS – "Growing the Glow" ! Eczema/Psoriasis Salve 2 oz or 4 oz.